Posted 9:40 pm by admin-lulu & filed under Uncategorized. 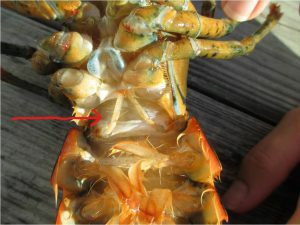 Our focus today is: How to determine the lobster’s gender. 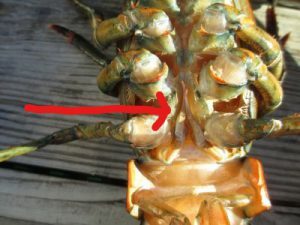 Swimmerettes are the feather-like appendages on the lobster’s abdomen (what is often thought of as the “tail” of the lobster). These swimmerettes are used with the crawlers (or legs) to manoeuver slowly on the ocean floor. If the first pair are calcified (like tiny, pointy legs) as shown above, it’s a male. When thin and feathery, it is a female. If you’d like to learn more about lobsters and the Maine lobster fishery, please let us know! Contact us and Captain John will be happy to talk to your group about these interesting crustaceans!